With week-long rituals and ceremonies, the Hindu Weddings celebrate the bonding of the two loving souls in a grand style. And to make this grand celebration even grandeur, 123WeddingCards has a fabulous collection of Hindu Wedding Invitations exclusively for you. Our beautiful wedding cards have been designed by keeping in mind that the Hindu Weddings are too colorful, lavish and vibrant in nature. 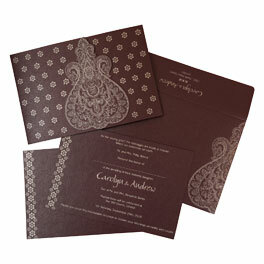 The rich texture, color and pattern of our cards along with a wide range of options will fascinate you instantly. The feelings of lifetime bonding, affection and blessing in our collection of Hindu marriage cards are an extra bonus for the future brides and grooms. For the perfect Hindu wedding cards, browse through our collection of Designer wedding cards; Scroll Wedding Cards and Indian wedding Cards. The Hindu wedding invites are an amalgamation of various ceremonies which includes Mehandi, wedding Sangeet, engagement, wedding ceremony and reception invitation. The format of Hindu marriage invitations designs is very elegant and include all the basic information with the use of Hindi wedding fonts. The designing of the Hindu wedding cards plays a significant role. With 123WeddingCards, we understand the zeal of your big day and hence with numerous options of modern invitations, we’ve ample of the options from where you can pick the best for your big-day. Keeping your enthusiasm going, we do also customize the wedding invites according to special requirements. With a special section of Hindu invitation on our website, we have a perfect match for your Indian wedding theme. We have amazing printing style options which can be a great match on your Hindu cards like silkscreen printing, flock printing, letterpress printing, UV printing, hot foil stamping and many more. At 123WeddingCards, we also have more than 500 fonts which can be your easy pick. You’re sure to pick any free wedding font and get it absolutely personalized. The Hindu shaadi cards are as beautiful as the wording on them. With options of getting them flat invitation cards or folding cards or layered cards, we have a limitless option of formats, colors, fonts, patterns, and themes. 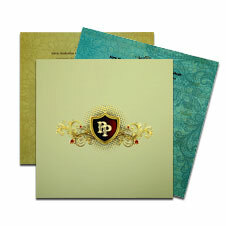 Providing completely on your wish, the glamorous and sophisticated is the new trend of Hindu wedding cards. With the on-going trend designs and memorizing patterns, our cards are sure to make a bold statement with its accents, shine, and affordable pricing.